W-Technologies was approached by a Tier 1 manufacturer who manufacturers security systems for the automotive industry. A part of their process involved a complex die which created excessive vibration due to break through shock. The company reached out to W-Technologies for help. The company was using a six station die which formed and blanked the part. The press was automated and was being fed from right to left and running 40+ SPM. 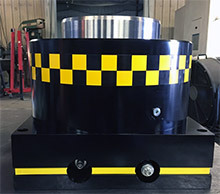 After assessing the customers needs, W-Technologies set out to provide the correct hydraulic shock dampers. They decided to use two W-Tech model H50 dampers with a cooling system. These dampers feature an external adjustment (capable of altering the internal pressure), a combined oil level site and temperature gauge. As well as a complete cooling system that requires minimal floor space. The W- Technologies’ H50 dampers successfully reduced reverse tonnage by over 67%, and increased SPM from 45 to 50. Contact W-Technologies today to learn how they can help you minimize break through shock.